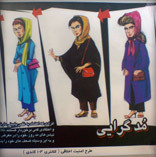 More posters regarding the Islamic dress code. "David is ur english friend who wanted 2marry an iranian still available? Are u watching channel 3? Mother fucker bastards [other words edited out] is sayin any girl dressin against our 'islamic stndrds' deserves 2b raped. I am nt stayin here 1more day. Whatever d price...". I wrote something back to this, philosophical it was – I kinda believed it too – it seemed to help calm things, at least until two days later when we were discussing this again over coffee. It felt wrong that two men sat plucking from history the development of nations to justify those broadcasted words. We aired our supposed views, one girl was steaming and the other not even listening, "I'm not staying another minute! ", shrilled one as the other tapped messages on their mobile. I joined my male friend in forgiving the bad mouthed child, "they are adjusting, in a difficult position, it takes time", and I kinda believed it too. Our development must be aboriginal, my counterpart pointed out, for we are not insignificant and this is our problem. "Iran is fresh to the industrial world, fresh to these concepts that have matured over a slow period among 'western' nations", I respond, "the Shah's time was a blip, a facade of the west, I'm not sure it suited the Iranian people and culture, not en-mass, such unequal development can crack the society and did". "Foisting these ways upon a nation without the background, the infrastructure or the understanding might cause more problems than solve", I suggested, ignoring counter arguments arriving with my every word. I went with it, consistently seeing this perspective out, "without these things we might be leaping into subservience (again? ), facing west, behaving western yet never being western – by that I mean being in control of our destiny". Our development must be aboriginal, my counterpart pointed out, for we are not insignificant and this is our problem. "Western seduction is easily succumbed to, frequently so and why not? ", I pointed out, referring to chronic brain drain of which our female friend wanted to contribute, "thus development is distressingly slowed". My counterpart reminded us that relative to the region things are not all that bad, I agreed, I champion Iran, would choose it over many other neighboring places – the other oligarchs – subservient or not – don't appear half as indigenous. But I threw it out there, "Iran is stalling", I suggested, "waiting for the inevitable new world order, where it will comfortably face east and allow itself (and be allowed!) a suitable renaissance", and I kinda believe it too.